Turn your Biggest Expense into Income! 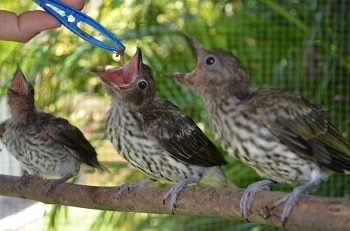 Breed Feeder Insects for Profit… or Start a Fundraiser for your Wildlife Group. 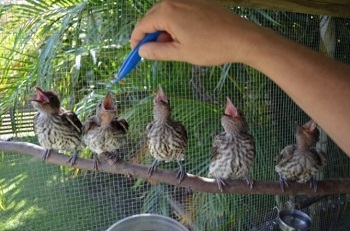 Feeder insects are a major expense to wildlife carers who are always looking for a cheap and convenient insect supply. After 13 years of producing and training people how to breed feeder insects, we can show you how to turn your biggest expense into income….and with much less effort than done previously! 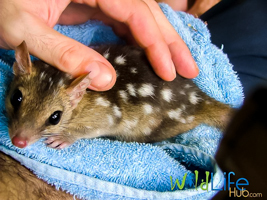 Feeding a large colony of insectivorous Quolls (Marsupial equivalent of a cat- see photo) was costing us a small fortune. We turned this situation around and sold excess stock for profit…this was the driving force for starting our insect breeding business. There is also a “Fund Raising” opportunity for Wildlife Rescue groups to have a volunteer breed insects for its members. Insects could be sold at a discount to reduce the financial burdon to carers, or to make money for the group. When breeding insects for profit it is important to understand your clients’ needs and wants. Below we briefly discuss the advantages and disadvantages of each species and why people choose them. of animals (fatten them up) and for gut loading (nutrient supplementation). • Are one of the easiest species of insects to breed by lifecycle. • Cheapest by weight usually. • Can be stored in the fridge for long periods for later use. For the above reasons mealworms are perhaps the most popular insect species used or bred for wildlife rescue. They are indeed a cheap and convenient food source however they are not necessarily the best species for developing an animal hunting instincts. (i.e. there are few bowls of mealworms in nature). For this reason, we use mealworms for improving an animals condition (fattening them), then use crickets and cockroaches to develop an animals hunting skills prior to release. Mealworms on their own have a lower nutritional value than other species with around twice the fat and much lower levels of protein, calcium and roughage than cockroaches and crickets. However they can be used to add nutrients and vitamins to an animals diet by gut loading (feeding mealworms high nutrition food prior to feeding). • As discussed above crickets are good to stimulate the hunting instincts for fast moving animals such as insectivorous reptiles, mammals and birds. Best used prior to release. • Cockroaches are good to stimulate the hunting instincts for reptiles or digging and burrowing animals. • In the past many people failed to breed crickets over the long term as conventional methods are high maintenance and often get devastated by pests. And Many people avoided breeding cockroaches due to the numerous escapees and smells. • At Wildlife Hub we have spent 13 years developing new methods so that crickets can be bred with the same effort as mealworms. • With automated feeding dispensers and efficient maintenance systems, cockroaches can be bred with much less smell or escapees. The best thing is that most of the materials to breed crickets (container, dispensers, heating etc.) can be used to breed cockroaches. So why not breed both species side by side. Our training resources to breed feeder insect for profit are the most comprehensive on the market and includes: Books, Videos, Skype Information Sessions and One-on-One Consultations. Our systems have been used around the world to not only set up new businesses but also to improve the efficiency of existing insect farms. 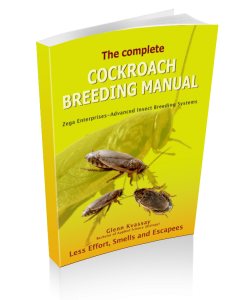 Click here for more resources to show you how to Breed Insects Efficiently.